1. 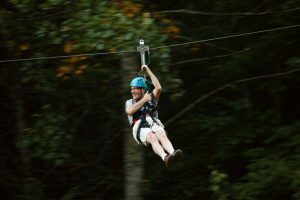 Ride the highest zipline in the Smoky Mountains. 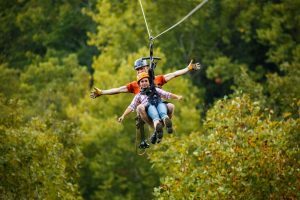 At Foxfire Mountain, you will find the highest zipline in the Smoky Mountains – the famous Goliath zipline which has the highest and longest lines in the Smokies. 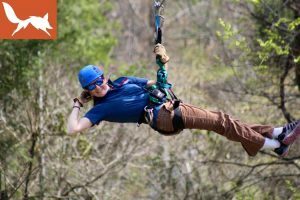 The Goliath zipline has you traveling for a half mile at over 55 mph and you’ll zip 475 feet above the East Prong of the Little Pigeon River. You’ll have beautiful views of the Smoky Mountains across Foxfire Valley and Dunn’s Creek. Click here to learn more about the Goliath zipline. 2. Take a waterfall canopy tour. Want to go ziplining in the Smoky Mountains over a waterfall? We have the only zipline where you can swing from tree to tree over a waterfall. This tour lasts around 2 hours and you’ll zip over Lost Mine Falls. Click here to learn more about the Waterfall Canopy Tour. 3. Walk the longest swinging bridge in the United States. The Bridge to Prosperity is the longest swinging bridge in the entire United States! The bridge is longer than a football field and crosses over the Little Pigeon River. For all the details about the Bridge to Prosperity, click here. 4. Stop by the Zippin’ Pig Barbeque for lunch. Since you will be spending the day at Foxfire Mountain, you’re probably going to get a little hungry along the way. Stop by Zippin’ Pig Barbeque for a quick lunch that will fill you up and give you the energy you need for the rest of the day. There’s also homemade Foxfire Mountain ice cream available! Click here for the full menu for Zippin’ Pig Barbeque. 5. End your day at the gift shop and Wyile Cider House. Like we said, Foxfire Mountain has more than just ziplining in the Smoky Mountains. You can also visit Wyile Cider Barn which is the only craft cidery in Tennessee. You can take a tour of the Cider House, taste the handcrafted ciders and pick up a few things from the gift shop to take home. Click here to learn more about the Wyile Cider House at Foxfire Mountain. Reserve your visit to Foxfire Mountain today! Adventures at Foxfire Mountain fill up quickly so it’s a good idea to plan your adventure as early as possible. 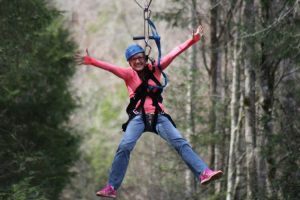 We want everyone to be able to experience ziplining in the Smoky Mountains and all of the fun attractions we offer on the mountain. Click here to take a look at all of the available tours and reserve your date and time. We can’t wait to see you at Foxfire Mountain!